State Woebegone: Minnesota Government Shuts Down : It's All Politics In a battle between a governmental chief executive and legislature over taxing and spending that is getting awfully familiar in the U.S., the Minnesota state government shut down after Republican lawmakers refused to consider tax hikes on the wealthy proposed by Democrat Gov. Mark Dayton. A glum Gov. Mark Dayton just before his state government shut down. In a battle between a governmental chief executive and legislature over taxing and spending that is getting wearingly familiar in the U.S., the Minnesota state government shut down after Republican lawmakers refused to consider tax hikes on the wealthy proposed by Gov. Mark Dayton of the Democratic-Farmer- Labor Party. St. Paul, Minn. — State government is officially shut down. State leaders blame each other. The shutdown leaves more than 20,000 Minnesotans out of work and others without state services. The sticking point to negotiate late Thursday night is the same as it was at the start of the legislative session: taxes. Gov. Mark Dayton and GOP legislative leaders met three times Thursday. But as the clock ticked closer to the midnight shutdown, the meetings grew shorter and the rhetoric grew sharper. Talks broke off at 3:30 p.m. and it became clear a deal wasn't going to be reached. Dayton confirmed the break down at 10 p.m.
As Tom goes on to report, there's concern by some Republicans that their party will get more of the blame for the shutdown since it's in the majority in the legislature. What's more, the shutdown should be fresher in voter memories when they go to the polls next year. 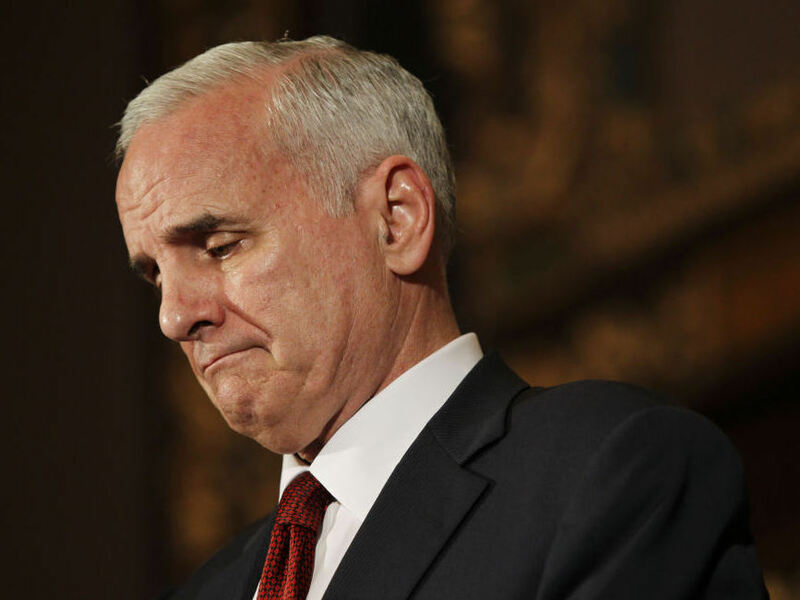 Dayton, a former U.S. senator, doesn't face voters again until 2014. The Minnesota Star Tribune provides some important details about the disagreement over how to close a projected $5 billion, two-year deficit. Dayton's final offer before the shutdown was to raise taxes on those making more than $1 million annually, which Republicans rejected. Dayton would presumably be among those since he is a member of the family whose wealth came from the department-store company that transformed into the Target chain. Soon after talks broke down, both sides lifted their self-imposed news blackout and began releasing details of their final budget offers. Republicans also offered to issue "tobacco bonds" of an unspecified amount to cover any remaining budget gap. Sources said Dayton considered the offer, but he criticized it as unwise borrowing late Thursday. Talks may have also broken down because an earlier GOP offer asked Dayton to accept controversial policy positions the Republicans pushed for this year, including photo ID requirements at the polls and abortion restrictions. An offer sheet provided to the Star Tribune said the policy adoptions were in exchange for "new revenue in a compromise offer." That deal also would have required tuition caps to be put in place at the University of Minnesota and MnSCU as well as a 15 percent reduction in the number of state workers by 2015. Tendered Wednesday night, the offer would have required a special session Thursday.